Most visitors to South Korea spend their entire stay in the Korean capital city, Seoul. Seoul is a one of the world’s largest cities and has an incredible selection of historic buildings, museums, galleries, restaurants and nightlife options to choose from. 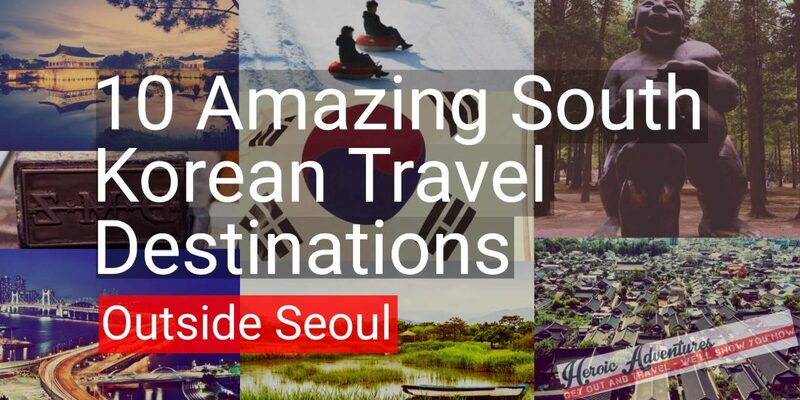 However, tourists who spend their entire trip in Seoul will miss out on some even more incredible attractions offered by other cities in South Korea. Here are 10 incredible destinations that any traveler in South Korea should consider visiting. Tourists from within Korea and neighboring countries know Gyeongju as the home of some of South Korea’s most mind-blowing historical sites, but tourists from further afield have often never heard of it. Located in the south-east corner of Korea, making it an easy day trip from the much larger coastal city of Busan, Gyeongju is the former capital of the ancient kingdom of Silla. Until roughly 1000 years ago, Korea was divided into three separate kingdoms, with Silla being the most prosperous. The most impressive traces of this kingdom that you can see in Gyeongju are fields filled with huge burial mounds and a museum displaying the contents of these mounds, with Gyeongju’s kings being buried with enough gold to make an Egyptian pharaoh jealous. Gyeongju also hosts some incredible temples, including a cave high in the mountains with a huge statue of Buddha which was been there since the 8th Century. Jeju is a volcanic island off the southern coast of South Korea which boasts of Korea’s most beautiful natural scenery. The dormant volcano Mount Hallasan dominates the island–and visitors can hike–don’t forget your hiking poles if you do, almost 2000 meters to its summits to enjoy incredible views across Jeju and the ocean around it. Jeju island also has some of South Korea’s most beautiful beaches and a laid-back local culture that will refresh anyone feeling overwhelmed by the relentless pace of life in Seoul. It’s also one of the best places to enjoy delicious fresh seafood in South Korea, as well as Jeju’s signature fruit, Jeju oranges. Busan is South Korea’s second biggest city, and as mentioned above, its closely situated to the historical city of Gyeongju, making it easy to combine a visit to both cities. It’s also South Korea’s closest major city to Japan, making it an ideal spot to take a cheap flight to Osaka or Tokyo if you’re visiting South Korea as part of a larger trip around Asia. Busan is more than just a travel hub, however. In summer, it earns the nickname ‘Seoul on sea’ as residents of the South Korean capital flock to Busan’s beautiful beaches and booming nightlife. Whether you want to relax by the ocean during the day or party long into the night, or both, Busan is an energetic city with plenty to offer everyone. Jeonju is home to one of South Korea’s biggest traditional housing areas, known as a hanok village. It also boasts some stunning Buddhist temples and is one of the best areas to experience traditional Korean culture. Beyond the beauty of the old hanok village, Jeonju is home to some of South Korea’s most delicious food. Jeonju is the birthplace of bibimbap, a dish of mixed rice, egg, vegetables, beef and hot sauce that has become somewhat popular in western countries in recent years. It also has an area dedicated to restaurants serving the Korean rice wine makgeolli, along with a plethora of delicious side dishes. Chuncheon is conveniently located close enough to Seoul that it can reached on the South Korean capital’s subway network. A stunning area of natural beauty, Chuncheon encompasses rivers, mountains, forests and islands, and enthralls visitors with some of the most beautifully situated Buddhist temples in South Korea. It is also the spiritual home of the spicy chicken dish, dakgalbi, with many restaurants offering the popular local variety of one of Korean cuisine’s tastiest offerings. Another area of natural beauty, Suncheon is in the far south of Korea. Its protected wetlands offer a chance to see some of the rarest birds in South Korea, along with stunning views across Suncheon bay to the ocean. An eco-museum explains the area’s environment to visitors, and boat trips and wooden platforms offer a chance to get close to Suncheon’s unique wildlife. Panmunjom is considered a must-see on any visit to South Korea. Although it lies a few hours north of Seoul, there are a ton of tour companies offering day trips from South Korea’s capital. Panmunjom is the area that incorporates the demilitarized zone (DMZ) which separates North and South Korea. Visitors can learn about the tragic history which divided the South Korean peninsula, as well as experiencing the strange sensation of peering into the mysterious country of North Korea. There are even meeting rooms set up across the border where visitors can technically cross over onto North Korean soil. It’s a beautiful city of winding hill paths and gorgeous ocean views, but what really makes Tongyeong a unique travel destination is its history. You may have heard of Lee Sun Shin, the Korean admiral who invented an armored vessel commonly known as a turtle ship due to its hard outer shell. These ships were used to defeat the much larger Japanese navy in a famous battle in the 16th century. Visitors to Tongyeong can visit the many small islands which Lee Sun Shin used as cover during this battle. Gwangju is a south-western city which, like the Jeonju, is located in Jeolla province, commonly regarded as offering the best food in the country. Gwangju also has a tragic history, as it was the site where a student uprising against the authoritarian government in 1980 was brutally crushed by the Korean army. This tragic event was an incredibly important point on the path to South Korea becoming a democracy, and elements of a rebellious counter-culture spirit are still present in Gwangju to this day. Yangpyeong is another city which can be easily reached on the Seoul subway network. Located to the south of the capital, Yangpyeong is one of South Korea’s best ski resorts. Seoul residents flock to its slopes in the winter, which offer much cheaper skiing than similar resorts in Europe and North America. While Seoul is by far Korea’s largest cities and home to a wider array of attractions than anywhere else, South Korea has a lot of amazing destinations to discover outside its capital. Any visitor to South Korea should therefore make the effort to get out of the capital city and experience the other great destinations that Korea offers.